I bought 2 of these for bedrooms. They are really pretty and the gold is muted which I was hoping for. The drop is short so great for a low ceiling room while still adding a sophisticated touch. 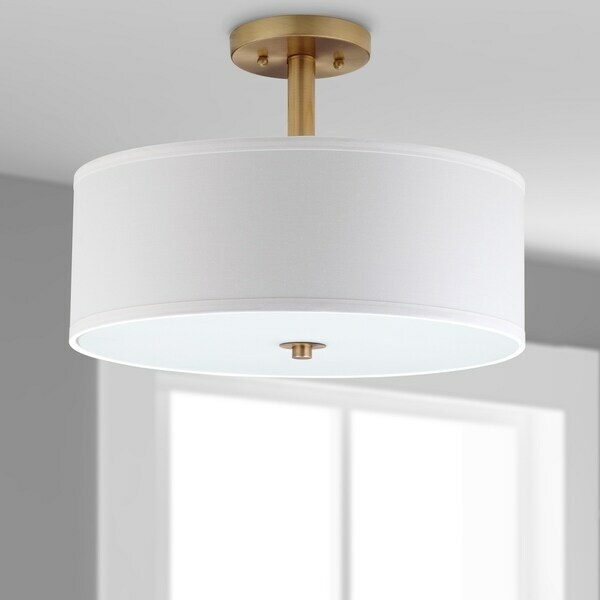 A handsome and understated fixture for transitional or contemporary rooms, the Clara ceiling drum light is dramatic in its simplicity and elegance of scale. Crafted with white cotton drum shade and gleaming gold accents, Clara casts a stylish glow. Dimensions 16.0 In. X 16.0 In. X 11.25 In. We love the gold accent of this simple light. We will be adding this to our nursery once complete and we are excited for it to be put up. It came just as pictured. We just installed this in one of our bedrooms. It is beautiful and exactly as described. Simple and elegant. It was easy to install and the size is perfect. I would definitely recommend. I was excited to receive these items. But upon arrival and installation I feel they were not worth what I paid for them. The materials were not good quality and lighting was underwhelming. Perfect for our mudd/laundry room! Very nice quality. Great value for the price! Looks good in the room. Bc it is clean and simple, with just the right amount of gold that I am looking for. "what are specific measurements for this fixture? I especially want to know how far from the ceiling does it hang and is that distance changeable? Are there multiple rods of differing lengths?" The length of the cord is 6". The full dimensions are 16" x 16" x 11.5".